Time-of-Flight Secondary Ion Mass Spectrometry is available only in some 100 industrial and academic laboratories worldwide. It is – complementary to XPS – a surface analysis technique providing chemical and molecular information of topmost layers at high spatial resolution. A focused high energy ion beam is rastered across the surface of the sample releasing characteristic fragments of the material to be analyzed. Secondary ions are mass separated and counted resulting in a mass spectrum of the sample (information depth approx. 1-2 nm). The lateral distribution of chemical functionalities can be obtained by rastering the primary beam and the sample itself. ToF-SIMS is ideally suited for the analysis of polymers, organosilanes or thiol self assembled monolayers, as well as surfaces from technical applications and environmental studies. Depth profiling and 3D imaging is performed by applying a sputter ion source eroding the sample with Cesium, Oxygen, or C60 ions. Charge compensation on insulating samples is facilitated by an electron flood gun. Several data processing tools allow for the analysis of complex sample chemistries. These approaches include principal component analysis of the multidimensional spectra or images and “gentle-SIMS” to correct for some fragmentation effects. ToF.SIMS5-100, ION-TOF GmbH, equipped with a liquid metal cluster ion source, and several sputter sources. All elements and isotopes are detectable, the sample has to be solid at RT and stable under vacuum conditions, powders are possible. Most biological samples require fixation, (freeze-) drying or other preparations. Quantification requires standards or calibration based on complementary techniques available within the KNMF. Detection limits: ppm of a monolayer for elements, sub-fmol for molecules. Dynamic SIMS is destructive because particles are removed from the surface. Fig. 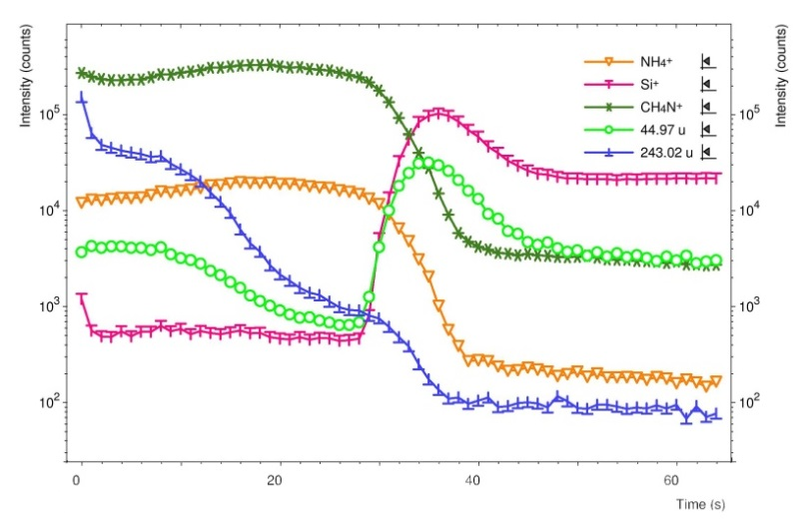 1: High mass range of a positive polarity secondary ion spectrum of a porphyrin derivative immobilized via silanol groups onto a silicon wafer (Bi3+). The multipletts reproduce the isotope distribution of this molecule and can be unambiguously assigned to the porphyrine headgroup, C54H58N5, etc. Fig. 2: Imaging of C2H3O2- groups demonstrating the local UV light induced photo oxidation of poly(9,9 dioctylfluorenyl 2,7 diyl) used a light emitting polymer for OLED devices. Stage scanning for large field of view. 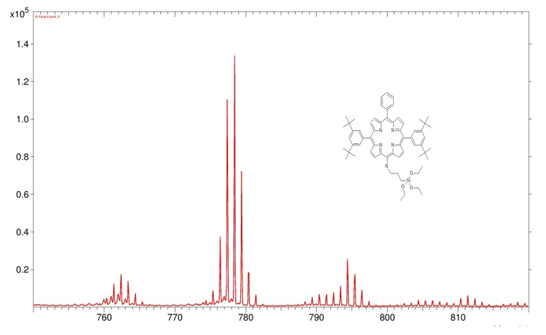 Fig: 3: Dual beam depth profiling (C60+ / Bi3+) of a polymer sample produced according to merrifield peptide synthesis. The depth distribution of triphenylmethyl proteting groups is shown by the 243 m/z signal (blue).